Offered to a packed and enthusiastic saleroom, the 750-lot silver sale at Lawrences (22% buyer’s premium) of Crewkerne was divided into three parts: an extraordinary reference library, a broad sweep of the market for British and Continental white metal and a niche single-owner collection. It brought two-and-three-quarter cheers. First up was a library, nearly twice as big as the historic 2500-book Brand Inglis collection sale which Lawrences’ expert Alex Butcher handled 15 years ago at Woolley & Wallis. Condensed into 223 lots at the January 15 sale, the Crewkerne (anonymous) group had been amassed over 60 years by a collector and his wife and covered almost every aspect of global silversmithing. Although lacking the runs of early 20th century sale catalogues which contributed to the £80,000 Inglis library, this archive nonetheless totalled £29,000 but with serious collectors, dealers and institutions all in action. Best by a distance was the two-volume publication Foelkersam, Baron A: Inventory of the silver in the Imperial Palace, Winter Palace, Anitchov Palace and Gatchino Castle. Published in St Petersburg c.1907 and rebound in half leather, it was estimated at £250-300 but sold at £3000. More than 90% of the lots got away. The second section of the sale comprising 370 silver and vertu consignment from other vendors enjoyed a similar success rate and a total of more than £170,000. Mainstream silver included a fine example of a favourite form: a 15½in (39cm) tall, 45oz neoclassical wine ewer by either William Elliot or William Eaton, London 1831. Decorated with foliage, shells and scrolls, the part polished, part matted ewer pitched at £1500-1800 sold at £3300. Small collections helped the bids keep coming. 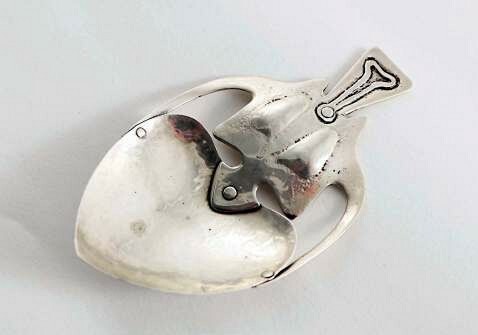 Among 30 lots of caddy spoons which totalled nearly £9000 was an example by Liberty & Co (Birmingham 1900) with a heartshaped bowl and sinuous handle. It quadrupled top hopes at £1650. Among the boxes sold was a castletop card case by Aston & Son, Birmingham 1860, embossed with a rare view of Victoria College, Jersey. It made £3800, nearly five times the mid estimate. 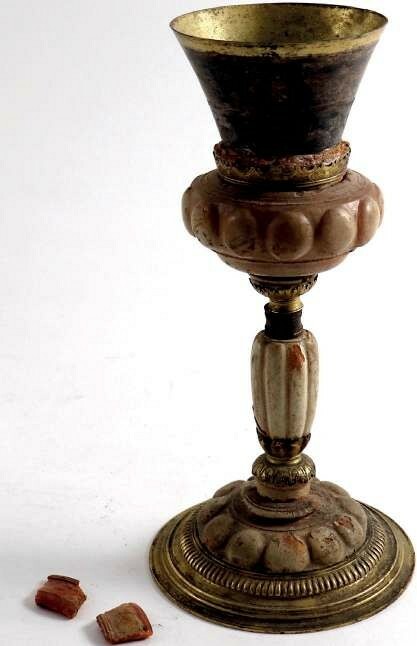 A 17th century amber goblet – £4600 at Lawrences. However, the two eye-catchers were unusual offerings. A 9in (22cm) high 17th century amber goblet with gilt-metal mounts – probably made in north Germany or the Baltic – came with an extraordinary story that explained its condition problems. The goblet had been removed from its Kensington home in 1939 to storage in the Surrey village of Hindhead to be safe from enemy bombing. However, in 1943 the Luftwaffe hit Hindhead and a fire bomb burned the storage facility to the ground. The damaged goblet was estimated at £400-600 but sold at £4600. 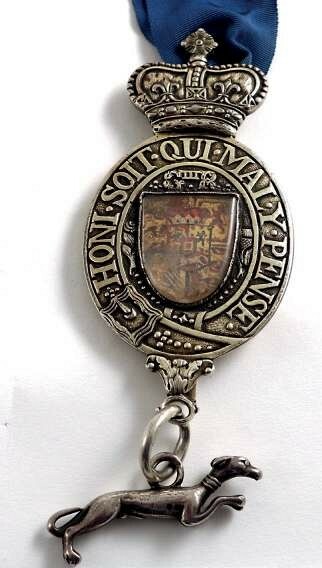 King’s messenger badge, 1801 – £2800 at Lawrences. The other rarity was a king’s messenger badge. Dating back nearly 1000 years, the royal messenger service continues in today’s age of computer hacking, with 19 trusted staff taking conidential documents round the world (although they no longer have to prove their skills of riding, shooting and swordsmanship). The parcel-gilt rarity at Crewkerne was made by William Pitts, London 1801. Measuring just under 6in (15cm) long, it was painted and gilded with the Royal Coat of Arms behind glass (from Victoria’s reign onwards the badges were enamelled) and bore the greyhound pendant introduced by Charles II. It sold above estimate at £2800. The third part of the sale comprised the 78 lots of ‘the Lion Collection’. This was the work of a Continental collector whose endeavours were the subject of a book (The Lion Collection of Boxes) by John Culme in 2014. The lots at Crewkerne were in the mid-to-good category, fully researched and provenanced and given estimates from three figures to high four-figures. However, as is the case with many collectors, the Lion man appears to have rated his pieces a little higher than buyers were sometimes prepared to go and 22% of them failed to sell. Nevertheless, the collection successes contributed more than £80,000 to the day, which left Butcher declaring himself delighted. Two textbook Cork ‘Freedom’ boxes led the collection. 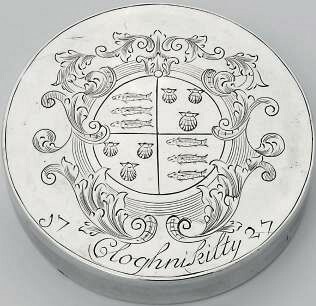 One was a c.1727 box engraved with a coat of arms and inscribed Cloghnikilty – the resort town of Clonakilty – by William Clare of Cork which went a shade above estimate at £6600. The other bearing a maker’s mark MS was probably made in Cork c.1652. Bearing the city’s arms, it was presented to the 20th Earl of Kildare and was among the Duke of Leinster’s pieces sold at Sotheby’s in 1984. At Crewkerne, it doubled expectations selling at £5000. Earliest entry was a London c.1682 tobacco ‘pebble’, a 3¼in (8cm) diameter box engraved with an armorial which trebled the estimate at £1800. A 3½in (8.5cm) oval tobacco box by Nathaniel Lock, London 1702, with a coat of arms and an inscription John from Elizabeth, November 13th 1702, doubled the lower estimate at £2400. 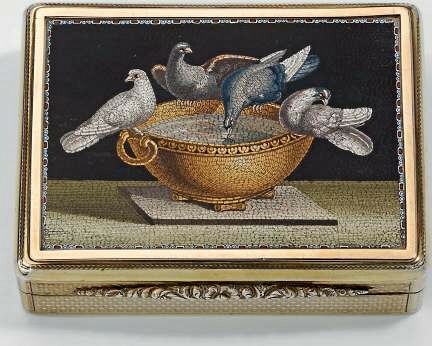 Topping the snuff boxes was one by Charles Rawlings, London 1828, depicting a favourite subject in micro-mosaic. The cover to the 3in (7.5cm) long silver-gilt rectangular box was inset with a panel of Pliny’s Doves within a gold border. Estimated at £2500-3000, it sold at £4100.